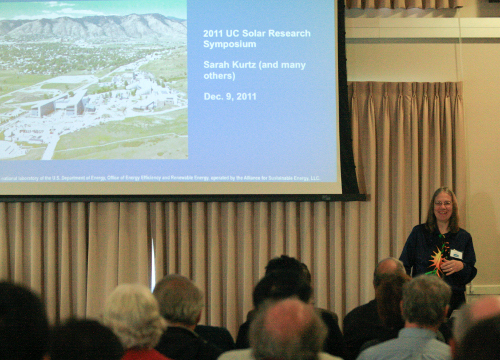 We hope you enjoy these photos of the 2011 UC Solar Symposium which were taken by our friends and colleagues. UC Merced Chancellor Dorothy Leland provides the symposium's opening remarks. UC Merced is the headquarters campus for UC Solar. 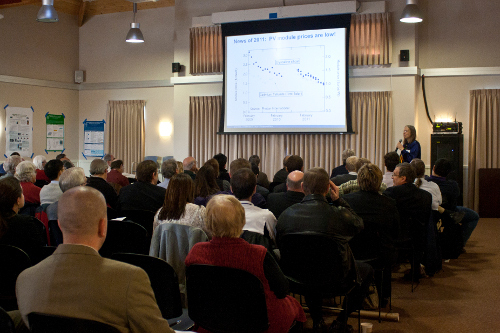 The five-campus institute also includes participating faculty and students from the UC's Berkeley, Santa Barbara, Davis and San Diego campuses. 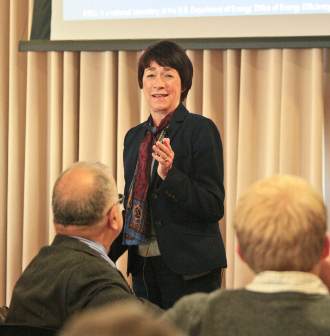 Sarah Kurtz, Interim Director of the National Center for Photovoltaics (NCPV) and Principal Scientist at the National Renewable Energy Laboratory (NREL) provides the morning's keynote presentation entitled "Research Paths to a Solar-Powered World." Sarah Kurtz seems to be enjoying a question from the audience. UC Solar Executive Director Ron Durbin (with winter beard) introduces Prab Sethi, Senior Project Manager with the California Energy Commission. Break time in the foyer of UC Merced's California Room. UC Merced Graduate Students Bennett Windyolar (right) and Joohyun Seo (center) talk solar cooling at the poster session. UC Davis Graduate Student Yu Hou introduces his research in solar energy storage. UC Berkeley Professor and UC Solar Co-Director Connie Chang-Hasnain (right) watches intently as graduate student Lun Jiang describes his work on a hybrid PV/thermal solar collector. UC Merced undergraduate student Melissa Ricketts (left) and UC Merced graduate student Andrea Rodarte (center) describe their research on luminescent solar concentrators. UC Merced Associate Specialist Yong Sin “Shon” Kim describes his work in PV system LCOE reduction to an interested observer.